Ballet where you least expect it can be a very fun thing and bring scads of life and levity to an otherwise mundane Monday. Take a peek at these and have a ball. 2) “Modern Daydreams: Deere John,” a wonderfully entertaining new find for me, by filmmaker Mitchell Rose, a former choreographer and performance artist. The music, Saint-Saens’ “The Swan” or ballet’s “Dying Swan” makes it all the more hilarious and perfect. 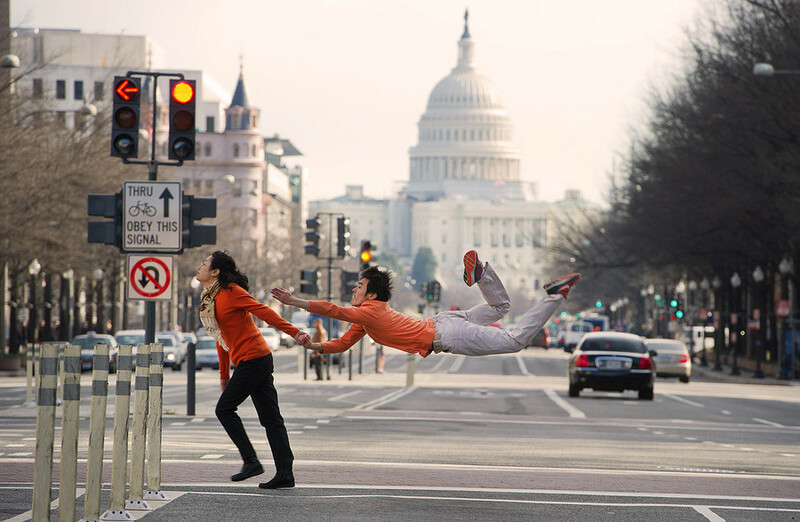 3) And, glory be, Mitchell Rose has a second ballet-based one, “Modern Daydreams: Treadmill Softly”. Both films are in collaboration with BodyVox dance company. 5) Then there are the “ballet where you least expect it” photos, by the wondrously creative and talented Jordan Matter. (All the photos used on today’s post are by him, and thank you, Mr. Matter and Jordan Matter Photography, for allowing me to use them!) Please reward him by dropping by his site (http://www.dancersamongus.com), where you can buy his bestselling photography book, Dancers Among Us, or a 2014 calendar, or various favorite prints. Now, I realize this last one isn’t a YouTube clip, really, but the pictures are so delicious and whimsical and brought the same smile to my face that the others did. And there’s a total of five of them. So I hope you’re okay with that, readers. This entry was posted in Ballet and tagged Alexander Ekman, ballet photos, BodyVox dance company, dancers among us, Daniil Simkin, Levi's jeans commercial with ballet dancers, Mitchell Rose, Modern Daydreams Deere John, Modern Daydreams Treadmill Softly, photographer Jordan Matter, Tribal DDB creative agency on September 30, 2013 by admin. Being haunted by music sounds like something I should be blogging about in late October, but with the sunlight growing autumnal, here in September, and nights growing longer, cooler, I think it will still work. And there’s no better way to describe the hold that Saint-Saens’ Symphony no. 3 has on me right now. Perhaps it’s the spooky intermittent appearance of the organ, as well. The piece is commonly referred to as “the Organ Symphony,” although the organ only appears briefly in the second movement, and in full force in the fourth movement, and then, oh, boy, how it appears, all fortissimo and heart-stopping and full-throttle. Very entertaining to observe in concert halls, when the organ pipes, the bigger the better, are situated behind the back center terrace seating (budget prices for a reason). If you, as the patron observing from a safe distance, know what’s coming, you can watch unsuspecting patrons rocket right out of their center terrace seats when those first chords of the fourth movement sound. Great fun. But what I want to wax lyrically about today are the first and second movements of Saint-Saens’ Organ Symphony. So incredible. Readers, please, do both of us a favor and listen to at least half of it. And if you really, really don’t have much time, go straight to the second movement. Well, that said, if you’re a person who dozes off during slow movements, no matter how achingly beautiful they are, never mind. Listen to the first movement. It rocks. 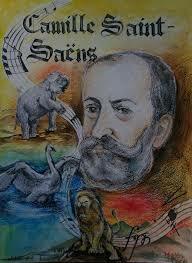 Camille Saint-Saens is such a great composer. I’ve written about how deeply affecting I find his music HERE. I’ve always been a fan of his “Introduction and Rondo Capriccioso” http://www.youtube.com/watch?v=N22c3_8gL4Q and then there’s the delicious “Dance Macabre” (http://www.youtube.com/watch?v=YyknBTm_YyM) and his Carnival of the Animals (I’m going to guess you’ve heard “The Swan” even if you don’t know it by name. It’s very popular. My dance readers will recognize it as the music for “The Dying Swan.”). But today is about his Symphony no. 3. This is a symphony with so many distinct and wonderful flavors, it just amazes me. And the first movement is so vibrant, unexpected, cinematic. The second movement utterly transports me. I’ll say no more. If you want to start up at the second movement, it’s at around 10m15. If you want to start at the beginning, it’s a lot more complicated but I’m sure you’ll figure it out. Okay, wait a second. I never want to force my writing on my readers. And I’m feeling magnanimous today. So, here are the answer to the quiz. Only if she’s wearing socks with those little skid-proof dots on the heel and foot pad. And if you want to go ahead and read my fiction excerpt, here you go. It’s from an earlier novel that might or might not make it all the way to the publishing finish line. Kye is my narrator. This is a flashback scene, ten years earlier when she was 13, a very intense, spiritual, musical girl who had a breakdown of sorts. Back from a residential treatment facility she’s trying to put her life back together. Which once again includes music. If I were you, I’d listen to the music first, then read. For the ultimate sensory experience, I’d suggest reading while listening to the second movement. For an even more ultimate sensory experience, I’d suggest drinking a glass of wine, too. A concurrent back rub might be too much, however. Same thing goes for a television playing in the background. Life recommenced, slowly but surely. She told her parents she wanted her music back. All of it. Her father kept apologizing, saying they’d just been trying to do the right thing by taking it away. She understood then, just how afraid of her and her instability they’d all been. And, in truth, the instant she came back to her music—starting with Saint-Saens’ Symphony no. 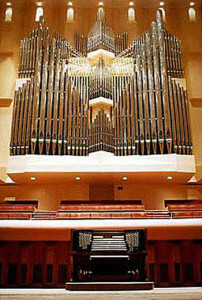 3, the “Organ Symphony”—it was like a hit of narcotics. Except not the kind they’d used to sedate her, “improve” her. The music sent the natural endorphins stirring, exploding within her, bathing her, soothing her. It was like in The Wizard of Oz, the black and white world Dorothy didn’t question until the moment she opened her Kansas door in the Land of Oz, and color met her eyes. So much color. Tears of relief, of joy, flooded her eyes, and she sat there and wept and smiled through the entire first movement. As for the second movement, slow and tender and almost unbearably sweet, it tore through her. Purged her. Cleansed her. Made her think there was, after all, something beautiful in the world worth living for. Does Classical Girl like Saint Saens’ music? Which letter in the alphabet comes first, “D” or “Z”? What is the first name of the author of the above excerpt? What’s one chicken plus two more? What year did Saint-Saens compose his 1886 classic, Symphony no. 3? What is Kye’s name in my fiction excerpt? What kind of cheese does Classical Girl like on her aged cheddar grilled cheese sandwich? What’s Classical Girl favorite Parisian city in France that also happens to be the capital? Was the French composer Camille Saint Saens born in France? Does Classical Girl run around in slippery stockinged feet down her hardwood floor hallway? Thank you for taking the quiz. You get an A. And I hope Saint-Saens’ Organ Symphony haunts you. In the nicest of ways, mind you. 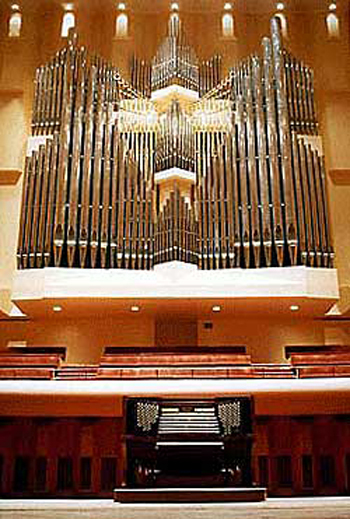 This is the San Francisco Symphony’s organ, inside Davies Hall, by the way. Note the oh, so close proximity of the center terrace seats to the organ pipes. Can’t recommend highly enough a San Francisco Symphony performance of Saint-Saens’ Organ Symphony. This entry was posted in Classical Music, The Writing Life and tagged author Terez Mertes Rose, Camille Saint Saens, fiction writing excerpt, Organ Symphony, Saint Saens Symphony no. 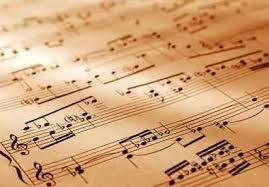 3, San Francisco Symphony, writing fiction about classical music on September 23, 2013 by admin. 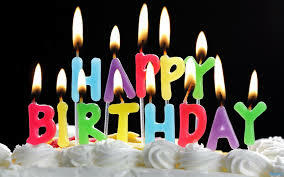 Today, September 17th, is my birthday. I am no longer that milestone, easy-to-remember “fifty years old,” I am now “over fifty.” Which, in truth, doesn’t bother me. I am healthy; my body and I get along well. 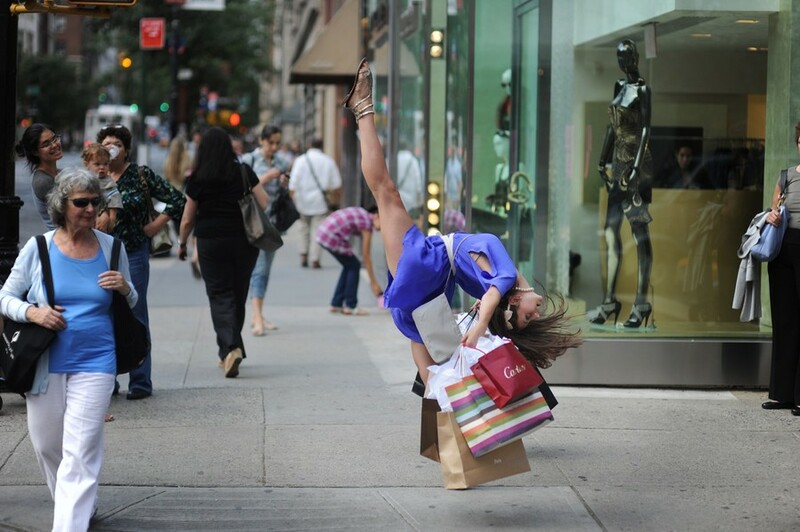 I can still dance, jog, kick-box and pretzel around in yoga. I remember as a kid, how “old “people (read: anyone over 39) would soberly intone, “be glad you have your health” and “treasure your health.” Back then, their reverence for it baffled me. Being healthy meant you never got out of school on a sick day. Never. Because I was very, very healthy. I can well appreciate their words now. I am fit and in good health and it sends a shiver of gratitude over me when I ponder what my quality of life might be if I didn’t have this. In particular, on my 51st birthday, I consider my ballet practice. While some parts of ballet suit me extremely well right now, all that work on alignment, keeping the belly pulled up and tucked in, striving for balance within elegant movement, there are other parts that challenge my joints in a way that the average 50 year old might be looking to avoid. The knees. The hips. 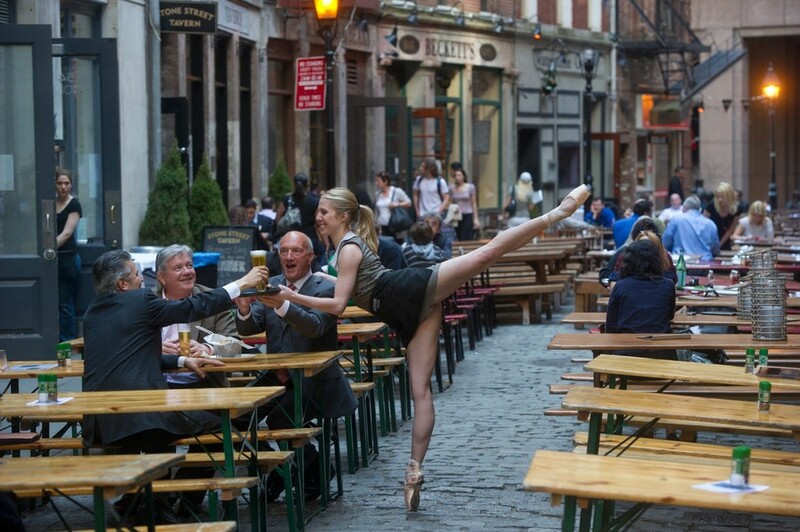 The fact that, in spite of the jumping and leaping we ballet dancers do, we are only wearing thin ballet slippers and not cushioned cross-training sneakers. But for me, it’s “so far, so good.” Lucky, lucky me. So. My continued good health is as much of a birthday gift as I could hope for. Well, that and a little champagne around cocktail hour. Well, okay, and one of those Baskin Robbins ice cream cakes (mint chocolate chip ice cream atop chocolate cake) that my son and I like so much and eagerly anticipate each September 17th. I suppose I do have one more wish. I’d love 10,000 views for my birthday. My blog, now that I’ve been working at it for 7 ½ months, is coming along nicely, with 70 blog essays posted, and it’s a delight to watch traffic come in from around the world, wanting to read my articles about Paris’s Palais Garnier (a HUGELY popular post) http://www.theclassicalgirl.com/502/ and prima ballerinas Alina Cojocaru http://www.theclassicalgirl.com/artist-spotlight-alina-cojocaru/ and Ulyana Lopatkina. http://www.theclassicalgirl.com/ulyana-lopatkina-and-her-swans/ Lots of people wanting to read more about violin virtuoso Augustin Hadelich, http://www.theclassicalgirl.com/augustin-hadelich-a-fiery-artistry/ and to my delight, there have been quite a few views of “John Cage’s As Slow As Possible”. http://www.theclassicalgirl.com/john-cages-as-slow-as-possible/ (This latter one, I sense, is because there is about to be a note change, occurring within a month, which, when a piece of music is being played as slow as possible — in this case 639 years — a note change is a big deal and won’t occur again until September 2020.) And my Mother’s Day essay. http://www.theclassicalgirl.com/duplicate-of-mothers-day-essay/ Who would have thought so many people around the world would be coming to read the Mother’s Day essay, through every season? My blog is at 9,840 views (over 30,000 views if you count spam but I only do that on bad days when I need an ego boost). On the average day, of late, I’ve gotten 75 views. On a good day it’s over 100. On my best day, it was close to 200. So. 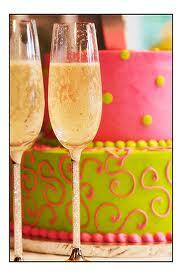 Feel like giving me a birthday gift this week? If you’re here, reading this, do me a favor and click on a few of the above links if you haven’t before read the article. Or heck, if you have, read again! Or send a link of this blog to someone who might be interested in the above subject matter. I’m so close, it’s thrilling. And even if you don’t do a thing, dear reader, you’ve already made my day by showing up to read this. You’ve made my year by showing up at my blog to check out my writing. In the early days of blogging, there were few visitors and views, because, well, that’s what happens when you start up a blog. It was a lonely, lonely time. Today, I feel utterly rich. I’ve got my health and I’ve got my blog with its interested readers. I’ve got supportive family and friends encouraging and enriching my endeavors. What a wonderful thing to celebrate on my birthday. This entry was posted in Ballet, Life and tagged Alina Cojocaru, Augustin Hadelich, ballet, ballet after fifty, birthday wish, birthdays, John Cage, mothers day essay, ORGAN2/ASLSP, september 17, Ulyana Lopatkina on September 17, 2013 by admin. “And I bring up the Schumann story to Freeda,” Kylie says eagerly. It’s not hard, what they’re proposing. In fact, it would be easy as anything. I’d much rather be writing about music than about church ladies squabbling over Catholic doctrine in regards to Kylie’s mystical experiences. Music and mysticism—that works. This entry was posted in Classical Music, The Writing Life and tagged classical music in fiction, creating fictional characters, writer's block, writing a novel on September 11, 2013 by admin.